S I G N & D I G I T A L G R A P H I C S • June 2018 • 31 Has your shop recently finished an outstanding sign or wrap job? We know you're proud of your best work and we want to help you show it off. 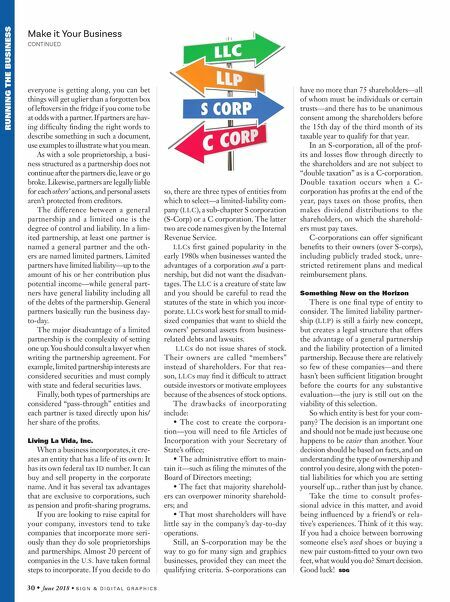 You can share your work with Sign & Digital Graphics readers and be seen in the pages of our magazine. Simply fill out the forms for Signage Submissions or Wraps Submissions on our website, upload your photos and we'll take care of the rest. Visit http://sdgmag.com/sign-project-submission to make a sign project submission. 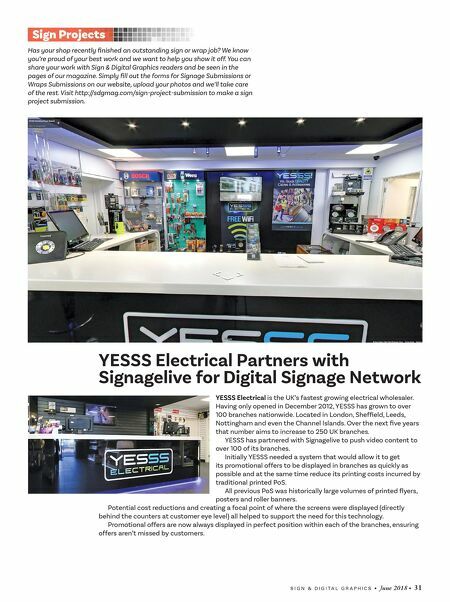 Sign Projects YESSS Electrical Partners with Signagelive for Digital Signage Network YESSS Electrical is the UK's fastest growing electrical wholesaler. Having only opened in December 2012, YESSS has grown to over 100 branches nationwide. Located in London, Sheffield, Leeds, Nottingham and even the Channel Islands. Over the next five years that number aims to increase to 250 UK branches. YESSS has partnered with Signagelive to push video content to over 100 of its branches. Initially YESSS needed a system that would allow it to get its promotional offers to be displayed in branches as quickly as possible and at the same time reduce its printing costs incurred by traditional printed PoS. All previous PoS was historically large volumes of printed flyers, posters and roller banners. Potential cost reductions and creating a focal point of where the screens were displayed (directly behind the counters at customer eye level) all helped to support the need for this technology. Promotional offers are now always displayed in perfect position within each of the branches, ensuring offers aren't missed by customers.